Plenti+ Nursing Pillow - Wing Dance is rated 4.8 out of 5 by 13. Mealtime is made easier for every mama using the Ingenuity Plenti+™ Pillow. The Relax-Fit design aligns with most body shapes to help offer support for both mom and baby. Crafted with the help of an IBCLC, an International Board-Certified Lactation Consultant this pillow was created to make nursing and bottle feeding comfortable. Its simple design acts as a positioner that helps keep baby in place. During those late-night snuggles or early-morning fusses, the visual tabs of our Breastside Reminder™ System help remind you which breast you fed from last. Nursing from the fullest breast helps promote the healthiest feeding opportunities for your newborn. The pillow material is also water-resistant to keep all the little accidents from leaking into places they don’t belong. As your little one grows, the pillow can be also used for lounging, tummy time and sitting support. Rated 5 out of 5 by Redsgirl2015 from Versatile Nursing Pillow I love this Ingenuity Plenti Nursing Pillow. What a clever idea to have the breast feeding tabs as a reminder of where you left off. Especially on those long nights when you're very tired. I love the firm support the pillow provides to babies back and shoulders while nursing. My husband can use it as well quite easily when he bottle freds. You can easily wipe spills from the case, nice design, durable and versatile. The outer case comes off and washes well. I let it air dry and was very easy to put back on. As my baby gets older we can use for tummy time to support her and to prop her up as she learns to sit up. Right now we use to prop her up on her back as a lounger, so she can see what's going on around her. Comes with a handy carry case, which keeps it clean when not in use and easy to transport. Rated 5 out of 5 by Amandasalt from Amazing comfort Every new parent needs this pillow. Nursing has became so much easier. The pillow is comfy but firm enough to hold my daughter and let me relax during latch time. It fits perfect into my body as i sit and feed. Its easy to clean the cover comes right off for easy wash and put back on. I am highly impressed. Rated 5 out of 5 by stephag90 from Cute and comfortable support! I love this Plenti pillow, it has a cute design and I really like the pink and white colors together. It helps give my baby support as I'm bottle feeding her and makes it more comfortable for both my baby and I. Rated 5 out of 5 by Tink from SO soft! Love the consistency of the pillow and how soft it is! Rated 5 out of 5 by Anonymous from Wonderful Nursing pillow The amount of support for both mom and baby provided by this pillow is amazing. It’s firm but not too firm. Keeps moms arms from getting tired when feeding baby. Also keeps the baby at the perfect height for easier latch. Wonderful product!!! Rated 4 out of 5 by Nichole from This nursing pillow is nice and firm, and thicker than my boppy! It actually boosts my baby up at a better position than the boppy. I love how my baby doesn't easily fall between the pillow and my body also. This also supports my daughter much better in a sitting position! The fabric of the cover is super soft and pretty! The only thing I feel could be an issue is it doesn't wrap around you as much as the original boppy, which then doesn't feel as secure. Other than that, it's a great pillow! Rated 5 out of 5 by Brittani30 from Great pillow! My little one isn’t due for a few months yet, but I can already tell we are going to get a ton of great use out of this pillow! It is the perfect thickness for both nursing and also tummy time. The pattern is adorable, and the pillow seems as though it will clean very easily! Overall, I am beyond pleased with this product, and cannot wait to use it with my little one! 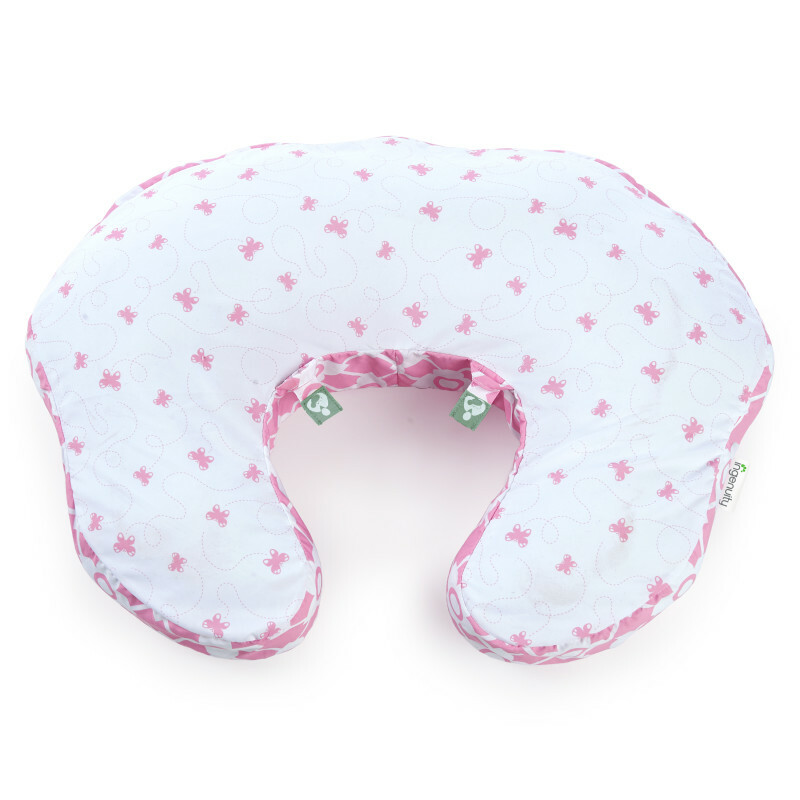 Rated 5 out of 5 by Blessedwithmany from Supports & Stays Put This a pretty great nursing pillow! I wasn't sure what to expect with it honestly, but after I tried it out I was pleasantly surprised! The thing I love the most about it is that it doesn't slip oit from underneath me like other nursing pillows. It stays put & supports in all the right places! (For reference if it helps, I am 5'5" & 160lbs.) The nursing tabs are helpful to put through the loop or to take out of the loop to help you remember which side you nursed on last. I haven't seen that on any other pillow. The material is light & airy so it stays cool on baby's skin while nursing & comes in very cute patterns. I ordered pink even though I have a little boy because I feel like he won't appreciate the pillow as much as I do anyway, haha! So that was something for me. It's just preference though. Overall I am quite pleased with this pillow & have nothing negative to say about it! I highly recommend!